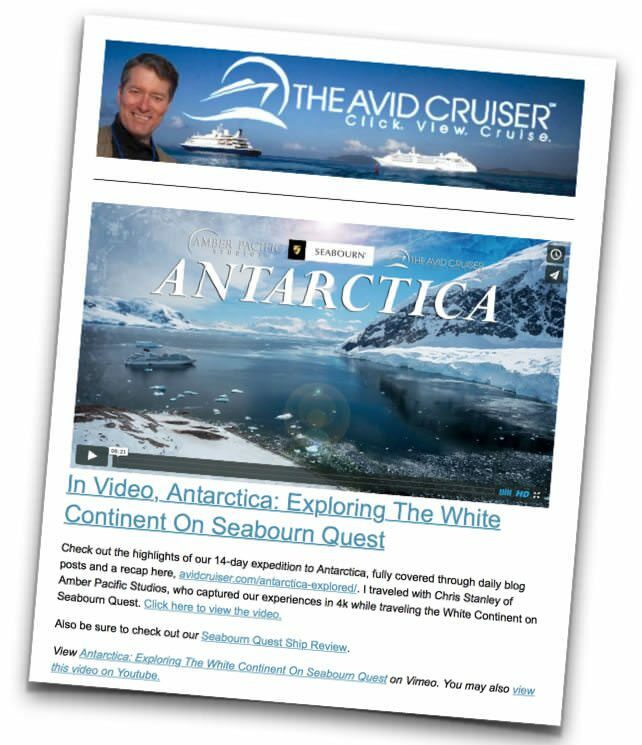 Subscribe to the Avid Cruiser newsletter. You’ll find lots of value in the Avid Cruiser newsletter, hand-crafted weekly by me and sent directly to you — at no charge. It is the best newsletter of all the travel newsletters I choose to receive. What you did for Antarctica was exciting and informative. Your daily diary has made me put that cruise on my bucket list. Keep the newsletters coming! Most informational and interesting travel newsletter of its kind. Don’t change a thing — just keep traveling and writing. Hi Ralph – my wife and I are looking to book a 10 to 11day cruise around the mediterrean.We are 63 and 64 years old.We would like to see Venice,Croatia,Montenegro,Greek isles,Sicily,possibly Turkey and then return to Venice – not essential but preferable.We are looking for a good overall experience on the ship – good food,all inclusive package preferably,good shows and entertainment,sauna and steambath and spa with massages,good ports to visit and interesting land excursions,good cabins. What cruise liner can you recommend to do this. We have looked at the river shadow and silver spirit and also looked at the one of Princess ships. Have you looked at Viking Oceans? I really like the Viking Oceans product. The six ships in Viking’s fleet carry just under 1,000 guests and have lots of included extras: WiFi, one included excursion in each port of call, beer and wine with lunch and dinner, a good selection of restaurants. Check out this article and let me know if it appeals to you.